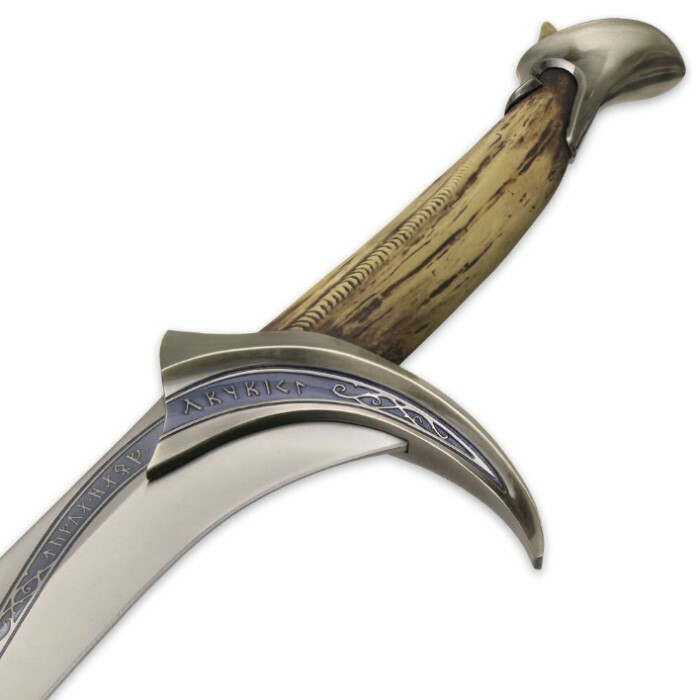 This is Orcrist, the sword carried by Thorin Oakenshield in the epic trilogy and used to cleave Orcs and Goblins. 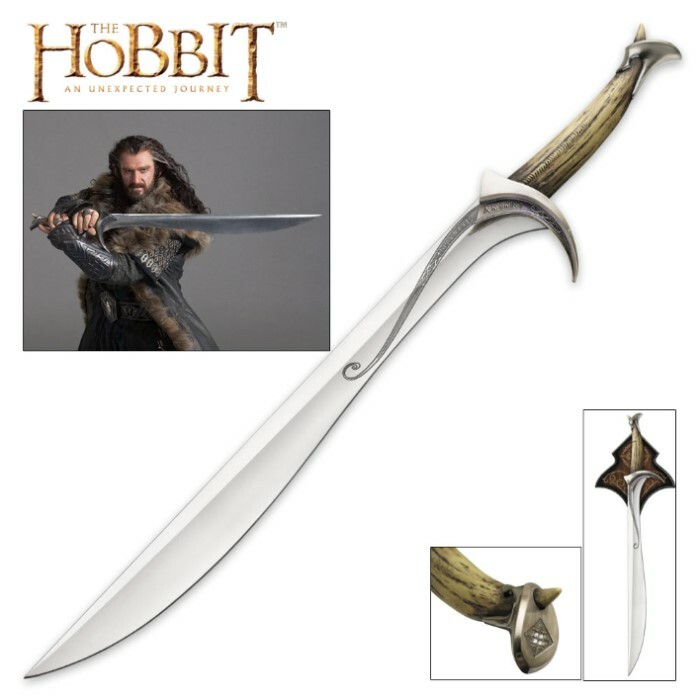 The 25-7/8" AUS-6 stainless steel blade is crafted to match the actual filming prop exactly, and it is completed by an acrylic/resin handle with a custom metal hilt and parts. This replica also includes a wooden wall plaque to display your new treasure in fitting style. 38-3/4" overall length. to the Kinggggggg!! To the Kinnnnngggg!!! The sword quality and wall mounting equipment are fantastic. My only small issue is that the "dragon tooth" handle feels a bit plastic-y. But, seeing as I don't have any orcs or goblins near my home, I plan on keeping Orchrist on the wall for simple display. I got a great show piece that surprised me with a hobbit-worthy map of the Lonely Mountain on the back of the certificate of authenticity. Thanks, Bud K. Shipping was right on time too. Both thumbs up. Orcrist is the flagship sword from The Hobbit and this replica does it justice. The blade and cross guard are literally a larger version of Sting with one edge, while the hilt is a dragon tooth. I love the way it was made to match Sting and if you own both swords, there's nothing quite like mounting them side by side. Well done, United. The weight, balance, beautiful design is awesome-perfect for any lover of The Hobbit! This is the first sword that I have ever purchased (I am 14 and had to save and work for it) and I thought this one should be this it. I am a big fan of all the movies and I love this sword!! The grip on it is fantastic. I don't know why some people complain about how they can "tell it is plastic". It seems fine to me! :) It will look nice on my wall. I love the blue highlight on it and it is a very good replica. When I save up again, I think I will add 'the foe hammer', and after that, Sting. 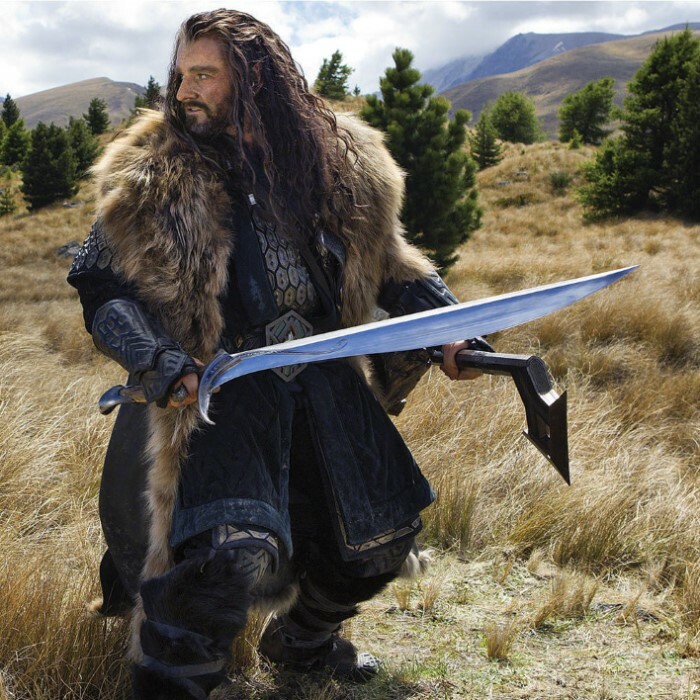 To go in order of appearance of course, though Thorin picks up Glamdring first. I really like the runes in scripted in the sword and the overall quality. It is in a class of it's own! I urge you to but it!!!!!!!!! !